David Borden was is in the room where the pitch wheel was invented, when it happened. He was one of the first people to beta-test Bob Moog’s Modular Synthesizer systems and MiniMoog instruments. His Earthquack Records imprint inspired Mimi Johnson to begin the legendary Lovely Records label with Robert Ashley. Borden formed the first all synthesizer ensemble, Mother Mallard’s Portable Masterpiece Company, in 1969 after Bob Moog graciously lent out his prototype synthesizers and allowed them to be blown up and repaired repeatedly in the process of learning patching techniques. If there was ever a missing link in American Minimalism, David Borden is that link. He not only composed, innovated and performed in the peak years of this imperative movement, but did so on his own terms, with a startling lack of recognition for his revelatory contributions to contemporary musical history. David Borden, born Christmas Day 1938, in Boston, Massachusetts, is an American Minimalist composer and electronic music pioneer. Music for Amplified Keyboard Instruments is his unsung masterpiece, released in 1981 on the now defunct Red Records based in Holland. After Mother Mallard disbanded in 1978, many of Borden’s solo compositions were not performed or recorded until long after the works had been completed. Music for Amplified Keyboard Instruments was released with little fanfare upon release, and suffered from seemingly limited distribution making the album an obscure classic from its earliest days. Those not lucky enough to obtain original pressings have had to settle for compressed YouTube clips and poor vinyl-to-digital transfers, while original copies of the album today are increasingly sparse and expensive on the used market. Spectrum Spools is proud to announce that 33 years after it’s original release, and after searching the archives of Borden’s private reel-to-reel tapes and recovering the one safety master known to exist, we are able to present this reissue of Music for Amplified Keyboard Instruments. Music for Amplified Keyboard Instruments contains four pieces each utilizing three players, and six keyboard instruments. The opening “Etsy Point, Summer 1978” begins with a mournful, ominous mood and slowly blossoms into an immense and humid labyrinth of colorful buzzing textures and howling melodies. “The Continuing Story of Counterpoint” is a 12 part cycle for synthesizers, acoustic instruments and voice that was labored upon for over 11 years. Parts nine and six, included here, are miraculous achievements in prodigious playing technique, remarkable mosaic-like structure and aural magnitude, operating in the relative terrain of Steve Reich and his “Music for 18 Musicians” or some of the “Dervish” works of Terry Riley. Borden’s compositions, however, are singular renderings of his own creative style, prying open new spaces of technique and expression that remained uninhabited by the minimalist composers of the day. The “Counterpoint” pieces here are rigidly arranged with breakneck key changes and intricate time signature manoeuvring. The resulting audio conjures kaleidoscopic patterns of beautiful melodies and compositional anatomy unparalleled in much of the American Minimalism we know. “Enfield in Winter” displays some of Borden’s more ambient leanings, with slow morphing drones and gentle pad sounds that erupt into shimmering patterns backed by a grandiose chord progression. 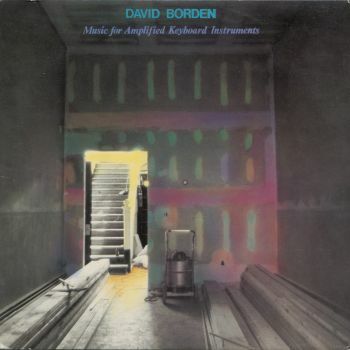 Though this wouldn’t be the only solo release by David Borden, Music For Amplified Keyboards represents a veritable zenith in Borden's corpus - a radiant achievement in sonic elegance, experimentation, and ambitious composition technique, deeming it a work of the highest archival significance. Borden went on to found the Digital Music Program (now known as the Electroacoustic Music Center) at Cornell and is now retired. He resides in Ithaca, New York with his wife Rebecca Godin. Music for Amplified Keyboard Instruments was remastered with love and transparency by Giuseppe Tillieci at Enisslab, Rome. These newly remastered works are superior to the original vinyl master, giving the world a chance to hear this remarkable work in highest possible fidelity across multiple formats. Extensive liner notes and photos by Borden are included to unlock the mysteries surrounding this elusive work. Spectrum Spools in cooperation with Editions Mego is proud to provide a definitive edition of a widely influential album to those in the know, as well as for those who are always on the lookout for a special recording they’ve not yet heard.